A 72 year-old male s/p wedge resection of a 0.9cm poorly differentiated Adenocarcinoma located in the left upper lobe presented with new nodules in the right and left upper lobes. 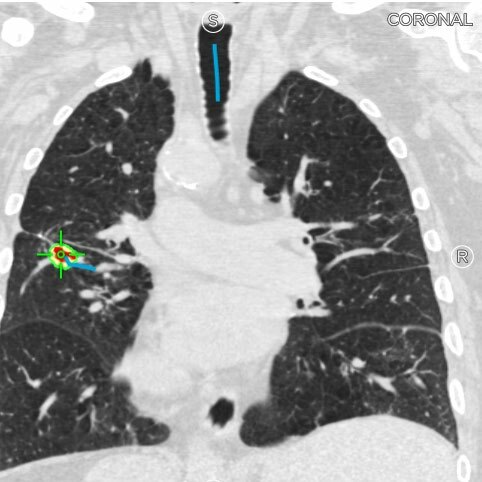 He was initially sent to IR for CT-TTNA of a RUL nodule, which came back alveolated lung parenchyma with focal fibrosis. He was then referred to Pulmonology for further evaluation. 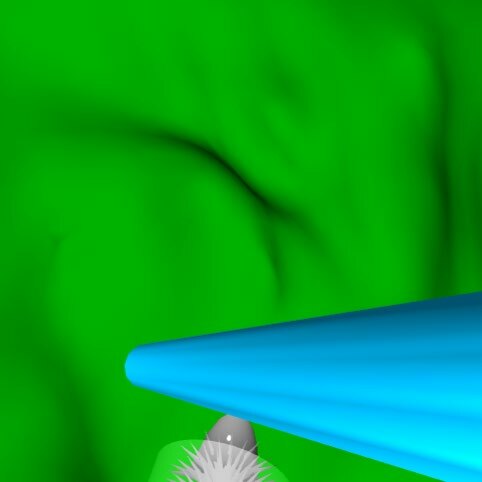 The SPiN Planning™ software was used to perform an auto segmentation of the 1.5 cm LUL nodule and define a pathway for access. 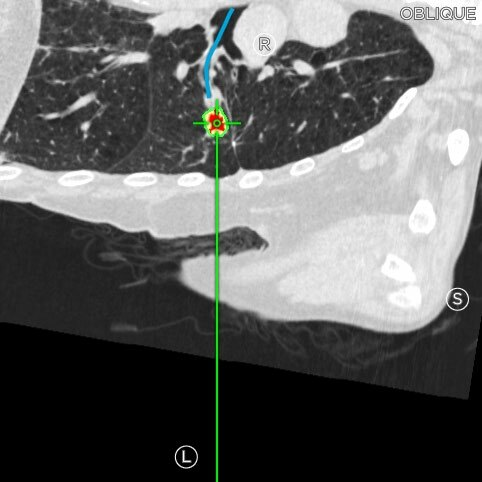 The planning CT showed that the previously biopsied RUL nodules had disappeared, confirming that they were not malignant. Dr. Furukawa started the procedure with Linear EBUS to stage the mediastinum. He then switched to Electromagnetic Navigational Bronchoscopy to obtain biopsies of the LUL. 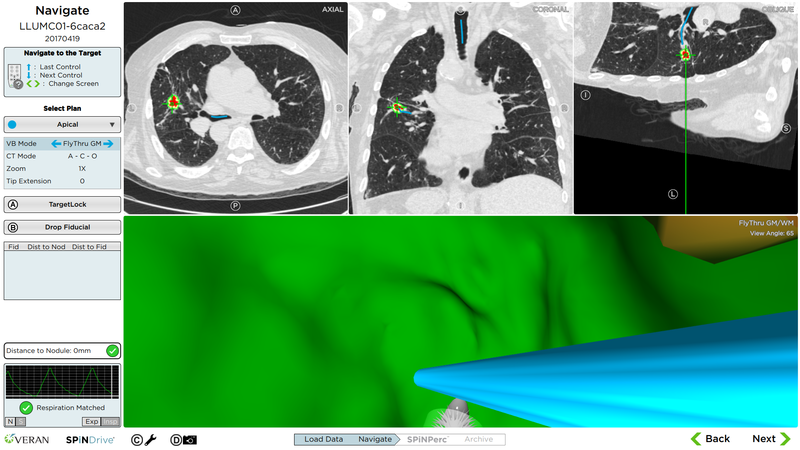 It was a difficult nodule to reach, but an eccentric view on Radial EBUS was seen and endobronchial biopsies were obtained with an Always on Tip Tracked™ brush and serrated cup forcep. Dr. Furukawa elected to proceed with SPiN Perc™ to obtain core samples of the nodule in addition to the endobronchial biopsies. Once the entry point was identified, Dr. Furukawa prepped and draped the patient in sterile fashion prior to performing the TTNA. SPiN Perc™ was then used to obtain multiple core samples that were identified as Adenocarcinoma of the lung. The endobronchial biopsies obtained were found to be non-diagnostic. Staging of the mediastinal and hilar lymph nodes using Linear EBUS was negative for local metastasis. The patient then went on to have definitive treatment with local radiation.